Sirius and Orion are in the morning sky, reminding me that winter is dawning, also. This sign sits at the corner of Highway 155 and the road across the mountains to Keller: “Chief Joseph, war leader of the Nez Perce Indians in the 1870s, was a military genius. In 1877, when his tribe was driven from its homeland by forces of white settlers, Chief Joseph led men, women and children more than 1500 miles through the Montana wilderness for escape to Canada. 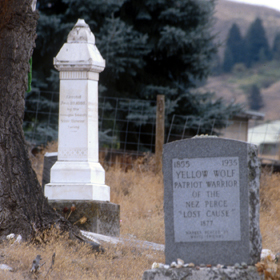 Captured near the border by the U.S. Army, and exiled with his people to the bitter country of the Indian Territory, Chief Joseph worked tirelessly for peace. He won a return to the Northwest for his Nez Perce in 1885. They were confined to the Colville Reservation in Northeast Washington. Chief Joseph forgave his enemies and was a peacemaker to the day of his death. He is buried at Nespelem. The sign is cast iron. Now, I know why there are no bullet holes in it. It’s hung from a six-by-six treated timber frame and the weeds are high around the base of the timbers. Directly behind the sign is an unfinished stone monument, which was to have included a water fountain, it appears. The water is turned off. The sign may have been designed to be mounted in the monument. Temporary measures have been taken. Flicker leads me into the cemetery as I wait for the sun to rise on Nespelem. The sign at the gate says, “No. 1072 NEZ PARCE CMTY.” It is cracked nearly in half. I go to Yellow Wolf’s grave. There is a small, round, red stone on top of the gray, granite monolith. I take it as Yellow Wolf’s gift to me and leave a gift of home-grown tomato from my mother’s garden. The sun has taken forever to come up, but now it does, as I stand at Joseph’s monument. Today, the gifts on his grave include a single dog-tag: “Jim Graham, Kayla Nalani, Christian, Island of Kauai.” A worn-out flicker feather. A horse shoe. A post card of Edward Curtis’ 1903 portrait of Joseph, old and tired in full regalia. In the picture, he looks beyond the photographer and the horizon, into another time and place, perhaps to his own death. The amulet is not where I left it. Many of the things that were here are gone, but the old elm still lives. When I am old, I wonder, will I still be coming here? Jay Red Thunder — 1931 – 1937 — someone still tends his grave. With few exceptions, people don’t live a long time here. On the Columbia, west of Nespelem. I drove through eight-foot-high corn to this spot. Flicker is everywhere this morning. A flock surrounds me. Across the river, Castle Rock rises. Evergreens fill its ramparts, but most of the country is golden grass or gray-green sage. There is some irrigation along the river. The corn behind me stands witness to that, and baled alfalfa up river. Mostly, though, it is basalt and sage. I am not sure where the Nez Perce camped, but it was somewhere between this rock outcropping with the irrigation pump mounted at one end and the mouth of the Nespelem River, six miles upstream. If they camped on the river, the site is flooded. There is not much wild river between the Grand Coulee and the backwater behind Chief Joseph Dam. The drowned trees at Coyote Creek may have shaded the lodges. I find the Colville Reservation museum has moved into an empty church up the street from its former location across from the Casino. The museum is closed. It’s Sunday. The casino is open. It is a slow day at Grand Coulee Dam. Hardly anybody is parked on top (It is still a few years until 9/11 closes the drive across the dam); older tourists in campers and local fishermen dropping their lines into the bay above Powerhouse Three, on the east end of the dam. Lake Roosevelt is nearly full, a good sign. I’ve seen it much lower. Today it is only six feet below top elevation. Lake Roosevelt disappears around the corner up stream, surface 345 feet above the river downstream. Leaning on the aluminum rail, I can feel the pulse of the river as it pushes the turbines ’round and ’round. “Your power is turning our darkness to dawn, roll on Columbia, roll on. There were coyote tracks in the road down to the river this morning. The smell of sage reminds me to cut some to take home. The red stone from Yellow Wolf is an agate, as translucent and rubine as the tomato I shared with him and Joseph; a rubric for the journey that begins today.